Want to hear about the National Broadband Network (NBN) rollout from the perspective of the Shadow Minister for Communications and Broadband? Malcolm Turnbull will be speaking and taking questions at the Bonner Communications and Broadband Forum at the Carindale PCYC next week. Ross Vasta the Federal Member for Bonner says that one of the main concerns brought to his attention is the lack of reliable and affordable access to Broadband in many suburbs throughout the local area. Mr Vasta says he has made frequent representations on behalf of Bonner constituents to the main telecommunications providers, as well as the Minister and Shadow Minister in Canberra on this matter. Where: Carindale PCYC, 27 Narracott Street, Carina, 4152. RSVP essential by COB Wednesday 13 June 2012 to erin.mcaliece@aph.gov.au or 3893 3488. 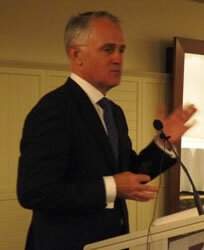 What questions would YOU like to ask Malcolm Turnbull? I saw your forum announcement on Twitter, and although I’m from NSW and won’t be able to attend in person, I would love it if you could ask a question of Mr Turnbull. I also think it would be wonderful if the questions and answers from the forum could be posted on the website.